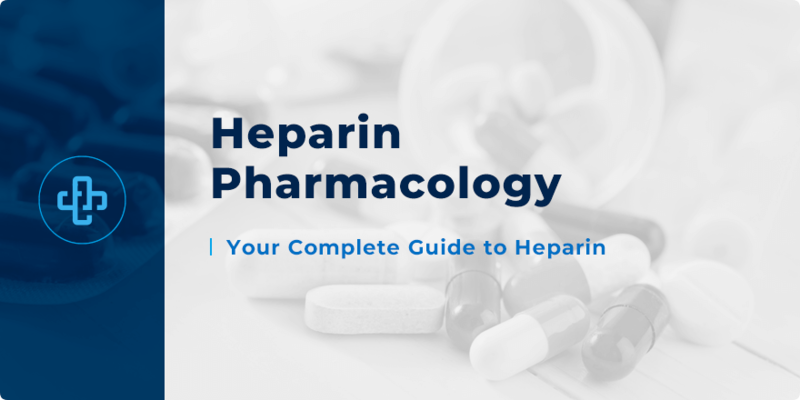 Clinical Pharmacology of Heparin | Everything You Need to Know! In today’s pharmacy blog, we examine and review the clinical pharmacology of heparin; an anticoagulant medicine that plays an important role in the treatment of venous thromboembolism (VTE) and arterial thromboembolism. Alongside heparin (and LMWHs), we review the role of a related medicine, fondaparinux – a chemical cousin of LMWHs. Depending on the clinical case in question, either heparin, low-molecular weight heparins (LMHWs) or fondaparinux – or a combination thereof, may be used. Below, we examine these indications in more detail. First things first, what is heparin used to treat? With these indications in mind, we need to understand the differences between the various types of heparin. What is the difference between heparin and LMWHs? Heparin is considerably larger than low-molecular weight heparins (LMWHs). The average molecular weight of heparin is 15kDa, whereas the average molecular weight of LMWH is just 4.5kDa. Heparin is also known as “unfractionated heparin” (UFH). APTT monitoring not required with LMWH. APTT refers to activated partial thromboplastin time, the speed with which clotting occurs. APTT monitoring is essential in patients taking heparin. There is a lower risk of bleeding, osteoporosis and heparin-induced thrombocytopenia with LMWHs. The antidote protamine sulfate can reverse the effects of heparin, but it cannot reverse the effects of LMWH (or the effect is very limited). Examples of low-molecular weight heparins include enoxaparin and dalteparin. Those two components are essential for the formation of blood clots (they are terminal factors in blood clot formation). Unfractionated heparin works by activating antithrombin which, in turn, inactivates clotting factor Xa and thrombin. LMWHs – such as enoxaparin and dalteparin – have a similar mechanism of action. However, these two medicines preferentially inactivate factor Xa. Fondaparinux inhibits factor Xa only. This mechanism does, then, come with a somewhat predictable side effect profile. The most important, and the most common, side effect of heparin is bleeding. The risk of bleeding is lower with fondaparinux compared to UFH and LMWHs. In rare cases, heparin can cause low platelet count combined with thrombosis – a syndrome known as heparin-induced thrombocytopenia (HIT). This reaction is more common with UFH than LMWH and fondaparinux. That the risk of bleeding increases in patients with clotting disorders, severe hypertension and in those who have recently undergone surgery. Patients with kidney damage may experience accumulation of LMWHs or fondaparinux. Low doses are, then, preferred. Alternatively, UFH may be used without the associated risk. Protamine sulfate can be used to reverse the effects of UFH, but it has a limited antidote effect on LMWHs. Protamine sulfate is entirely ineffective in reversing the effects of fondaparinux. Intramuscular injections of heparin are avoided to prevent severe bruising. Heparin can be administered IV or subcutaneously. Heparin has a short half-life of 1 hour whereas LMWH has a half-life of 4-5 hours. This means heparin requires more frequent dosing than LMWH. For long-term coagulation, heparin is usually given to commence anticoagulant therapy before a long-term oral anticoagulant, such as warfarin, takes effect. Want to learn more about the clinical pharmacology of heparin? Maybe you want to test your knowledge? Join our member’s area today to gain instant access to quiz questions, infographics, tutorials, guides and study tips and tricks!